What is your biggest fear of learning a new language? For many, it is a fear of not knowing what to say. In this article, we are going to set out a few formulas for language learning, and these exercises will result in you having some key sentences at your disposal. Because I’m learning Spanish, I’ll share what I’m learning as illustration, and you can apply your own language of choice. One important thing when learning a new language is to learn some sentences you will actually use. If you think back to your high school foreign language class, there were probably many times you were putting new words together into sentences, but how often would those come up in a conversation. Do you remember “Your blue table has four legs and is in the kitchen.” You’ve covered a lot of vocabulary. Example: What is your name? My name is Dana. Why did you choose to learn a different language? What have you found hard about learning this language? Do you have any goals you are working toward now? Maybe you can think of some other questions you’d like to answer. If you were being introduced on stage at a big event where you were the guest speaker, what would the announcer say to get the crowd excited about your presentation? Don’t be limited by these questions. Think up your own conversations, ones you are likely to have. I have a couple that I’ve added to my list. When I call for a pizza delivery, I want to have my questions and responses written out for me so I can get my order right and not get anchovy pizza instead of mushroom. Over time, this process will help you in crafting other sentences automatically in numerous settings. 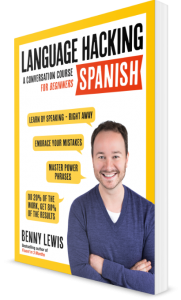 The Language Hacking book by Benny Lewis also focuses on getting you talking sooner rather than later. His book is very helpful in having you work through scripts of conversations you would likely have when meeting new people. If you learn and memorize those conversations, you are on the way to being able to communicate with others. Each time you have a successful interaction, your confidence will begin to increase as well. In the course of learning how you would answer a given question, be sure you know how to ask the question in the foreign language as well. (From the example above, “Como te llamas?”) In addition to being prepared to answer likely questions, you can also be the one to start a conversation by asking your new friend the question. Remember, they will quite likely ask you the same thing in return. And, now that you’re prepared, you will already have the answer! BAM, your first conversation success!! 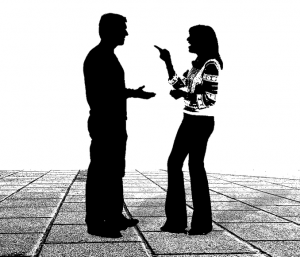 In addition to having a few conversation points, you should have these words ready to go. Being polite in a new language is also very much appreciated by the native speaker. Another helpful phrase, not listed above would be: “I’m sorry. I don’t understand.” It could easily happen that after starting a conversation with a new friend, they may proceed into uncharted territory. Now what? Have the “I’m sorry” statement ready to fire. The hardest part about getting started in a new language is that first conversation. So many of our interactions start with “Hello, my name is ____. How are you today?” But then, beyond that, it becomes more difficult to know what to say, what to ask. Hopefully these questions and this exercise of thinking through your answers and then researching the correct translation for what you’d like to say, will be helpful to get you talking! You will soon be at ease speaking in a different language. You will be communicating on a new level. Best wishes! Check back and let us know how this works for you! Share your comments, questions, and experiences in the comments below. We enjoy reading them and promise to respond as well.